The weekend started with Tom picking me up at 1500 and fighting our way through the Welsh Marches up to Chester and somehow through the torrential rain and traffic we managed to finally hit the M6, stopping only in Warrington for supplies where Tom couldn’t contain his excitement and started to chuck beer bottles around the Tesco store; ”clean up on aisle 15”. We pulled up at the Northern Pennine Clubs hut Greenclose to discover we had the hut to ourselves for the weekend. A thoroughly amazing cottage which is very comfy and extremely well equipped for living! Just turn up with food, beer and a sleeping bag. The rest is good to go. We got the kit unloaded with Lee and whilst this was happening Richard pulled up aswell. Tom shot off for a curry whilst me and Lee had a liquid meal of Black Sheep ale and pondered over surveys. 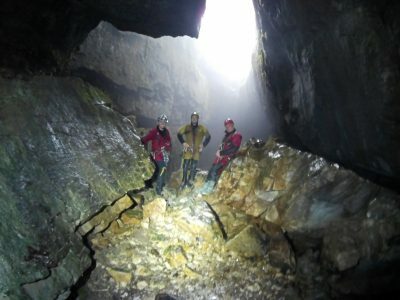 We all discussed plans for the weekend and decided the caves and routes. Saturday will be Swinstos to Valley Entrance pull through followed by Alum Pot. 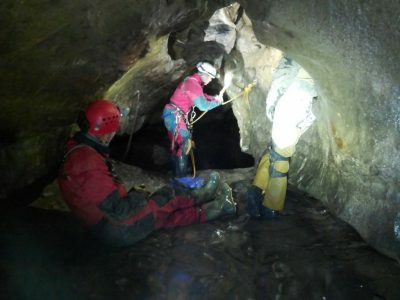 Sunday would be Bar Pot to Gaping Gill for a good poke around and then Monday would be Dowbergill Passage to Dow cave (a black book caving trip…not for the faint hearted). After a quick rope pack we settled down for the night. Swinsto to Valley, pull through. After an amazing kid free sleep (apart from Toms usual bed wetting issues) the bacon and coffee was soon on the go whilst kit was loaded into Toms car. 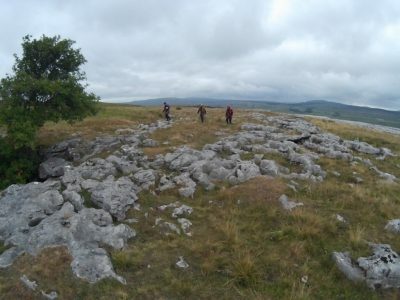 After a hearty leisurely breakfast and more coffee we set off to Kingsdale. 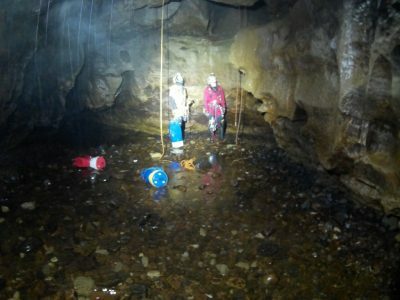 We pulled up in the stunning setting and quickly got kitted up whilst another team of cavers also pulled up. 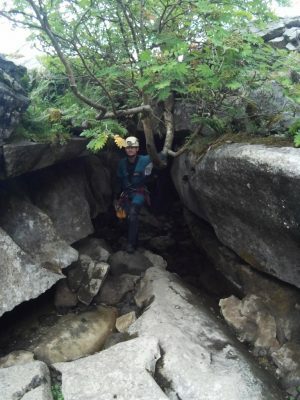 We decided to go into Valley entrance and stooped/crawled our way to the pitch which would be our climb out of the system once we had completed the pull through (there is a rope in place but always worth checking it’s still there). Lee rigged our own exit rope to save using the pre-rigged. We turned round, stooped and crawled back out. SRT kit loosened off we headed off up the hill to find the Swinstos entrance, after checking a couple of shakeholes we found the entrance which helpfully has a metal tag to identify it. 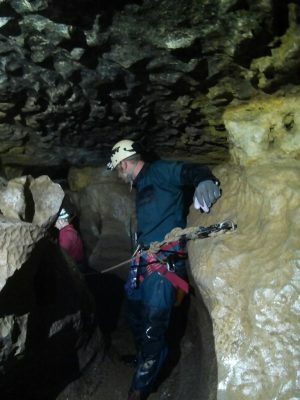 Just as we are re-tightening our harnesses the other team of cavers turned up and they said they will give us 15 minute gap before they come down. Best get on the move then! 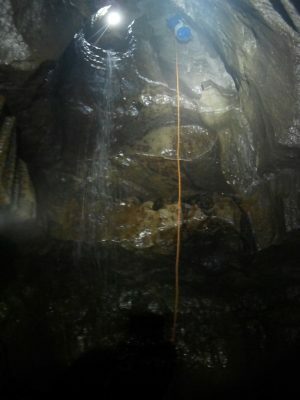 The entrance is near enough a crawl but was substantially dry today and is met fairly soon with the first pitch which is also permanently rigged just incase you get down and realise the water is too high. Me and Lee descended this and shouted up to Tom and Richard that we were going to shoot off to start rigging the next pitch. 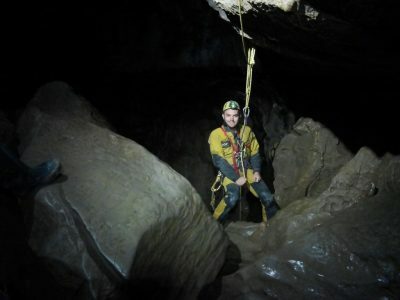 Next up is the Swinsto Long Crawl, 200m of hands and knees which for a South Wales caver is nothing out the ordinary but it does seem to go on a bit! 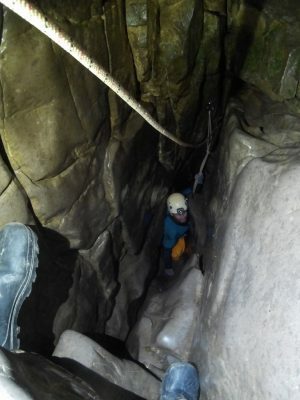 Whilst we were rigging the next pitch Tom and Richard emerged happy enough from the crawl and down the pitch. The rope pulled through nicely and we were on our way following the water. 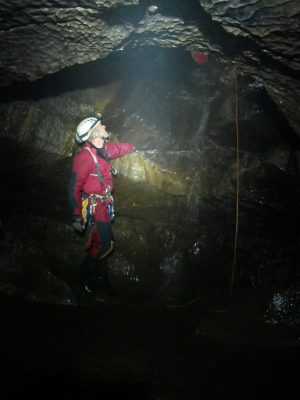 Tom rigged the next pitch which was descended and pulled through yet again very nicely. The Split Pitch (my favourite bit) was met. Although very high it was very dry today compared to when I last here and you couldn’t hear anybody talking due to the huge waterfall you abseil down. At the bottom I unclipped my little admin pouch off for some water and food whilst the other guys descended and once they were down we headed off down the streamway, a sporting section with tight traverses and cascades to keep you occupied for 20 or so minutes. 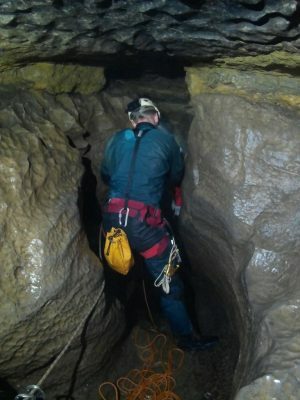 It’s once we had got to the end of here to Spout Pitch that I realised I had left my pouch at the bottom of Split Pitch and had to go round to retrieve! Hoping not to bump into the guys behind us to save embarrassment. I rigged Spout Pitch whilst everyone else had a bite to eat and then within no time at all we had pulled and packed the ropes away again and headed on down to the Cascades where at the end you are rewarded with a small pitch with Simpsons pot entering from the left and Swinsto Great Aven ahead of you! A huge aven which is worthy of a few moments of awe. 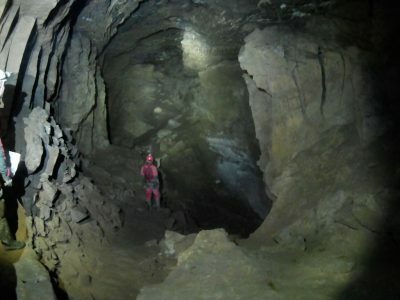 Now all that was left was to exit via the Kingsdale Master cave. Tom and Lee decided to go left through Philosphers Crawl, whilst me and Richard went the more gentlemanly route where we all met up in the main stream. 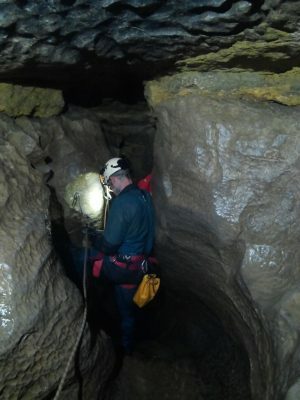 We then headed on down stream to the exit pitch and upwards. I de-rigged whilst everyone else starting heading back out the way we had come a few hours previous! 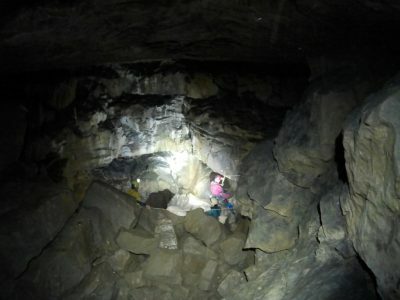 We got back to the car to find a rather nice camera from the other cavers which they had left on their bonnet! We took a selfie and then safely stashed their camera away from prying eyes but visible enough for the owner to spot. We didn’t bother getting changed as we still had unfinished business for the day. ”Alum Pot” please driver. We paid our fees to the farmer and then drove as close to Alum Pot as we could. Quickly donned our SRT kit again and headed up to Long Churn entrance. A novice entrance but what a novice trip! It certainly beats Eglwys Faen. A nice active and sometimes very dangerous streamway passes through several easy obstacles, swirl pools and climb downs to meet Dolly Tubs pitch of 18m. 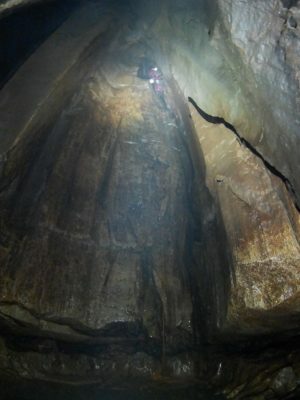 It’s actually free climbable but it’s just on the limits for a qualified Cave Leader to take kids down on a ladder lifeline. Richard rigged for SRT on this occasion as we were only here to get to the famous viewing ledge and soak up one of the best views in the UK. We all got down and spent a good twenty minutes taking it all in. A view I have seen a fair few times before but still takes my breath away. Sadly the pictures didn’t come out great and the battery eventually died. On exit a few decided to go through the ”Cheese Press”….doesn’t take the brains of the arch bishop to work out how nice a squeeze that is. Back to the club hut for beer and cottage pie. 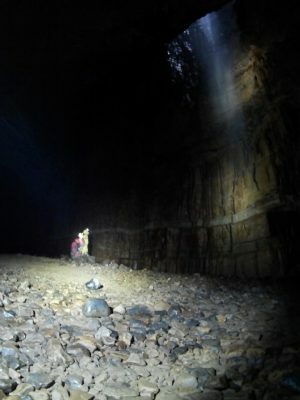 Bar Pot to Gaping Gill. 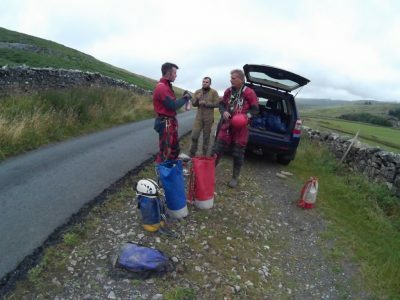 The original plan was to be an exchange trip with 2 of us rigging Dihedral and the other 2 rigging Bar Pot but we decided against this purely because we couldn’t be bothered carrying another 100m of rope halfway up Ingleborough. After some bacon sarnies we got changed at the cottage to save the poor village of Clapham having to see us getting changed. We parked up and was soon on our way up the hill. 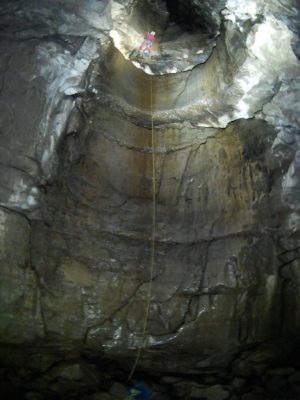 A very long sweaty walk in but stunning scenery and Trow Gill was alive with rock climbers giving us mere cavers confused looks. 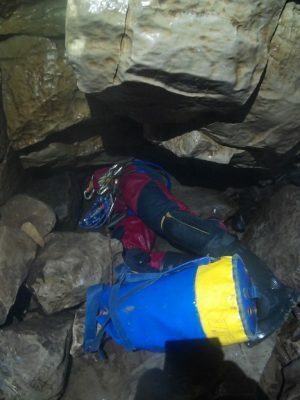 We rested for 10 minutes in the Bar Pot shakehole and then got SRT kit on. 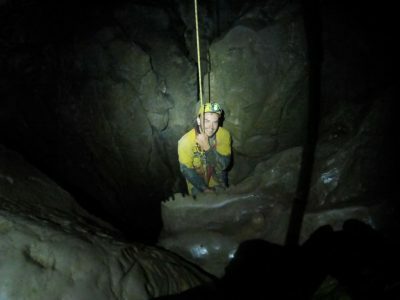 Lee pushed forward to rig the entrance pitch and slid in to be next down. 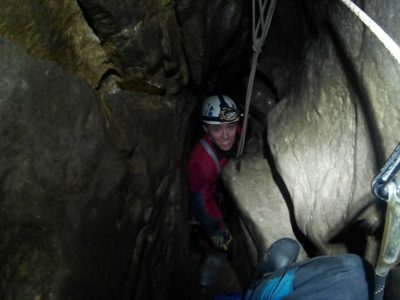 It soon became clear that me and my giraffe legs were going to have fun with this tight pitch on exit! Last time we came here I had used Small Mammal pot so never had the fun. I clipped into the traverse and proceeded to thread my descender and then further proceeded to get wedged, much to Toms amusement with the camera. I got myself free and descended. Everyone else was soon after and we made our way down to the big pitch. 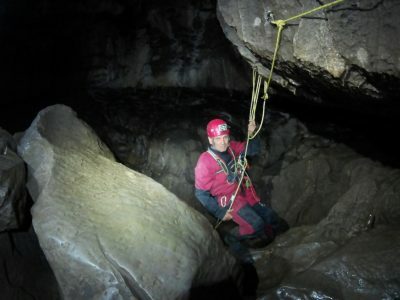 Richard offered to rig so the rest of us relaxed and rehydrated and one by one made our way down this stunning pitch happy in the knowledge we would soon have to be jamming our way back out this way. 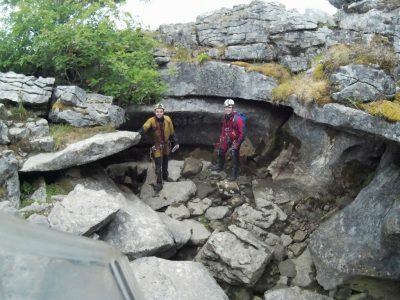 We shred the SRT kit at the bottom and made our way into the Gaping Gill system via the South East passage which is a mix of hands and knees crawling and some stooping for good caving measure. But soon the slog was worth it as you turn a corner and are rewarded with an immense wind followed by the noise of water crashing. 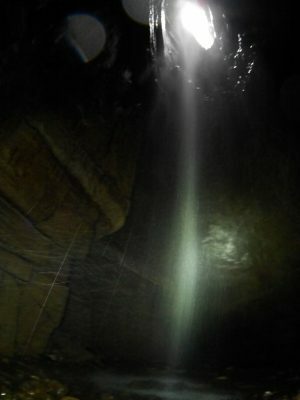 Gaping Gill main shaft/chamber never ceases to amaze me so what a perfect place to stop for lunch and have a good old mooch around taking in the mind-boggling size of the place. Lunch over we popped up and over the boulders into Old East to look at some formations which sadly have seen better days. Turning around we decided to make our way out via Sand Caverns which funnily enough look like Sand Caverns in Agen Allwedd back home! It’s in the hands & knees crawl of South East my wrist which I had twisted the day previous really decided to give me a fair amount of pain and throbbing. Wasn’t looking forward to having to jam back out but luck would have it that I managed to get up the big pitch without too much pain and was cheered up by the sound of Tom making his way up, effing and blinding as usual. Now the final pitch was a different matter, I got wedged again and couldn’t undo my chest jammer due to it being solidly against the wall. 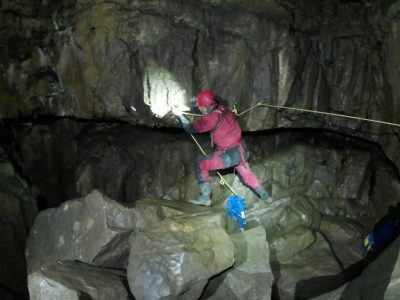 Luckily I wasn’t first up and Lee managed to squeeze his hand in and release me off the rope! 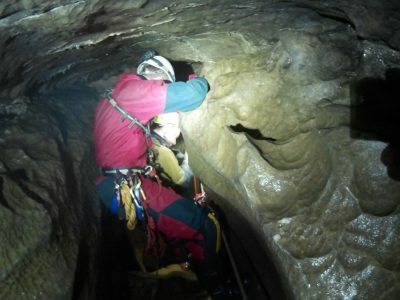 Now to pass the squeeze and get off the traverse line with effectively one hand…..
We were soon all out and on our way towards Gaping Gill entrance just to have a look and take a picture. Cancelled due to my wrist but will be the first trip when we return soon! An epic weekend and plans are already afoot to return more often. 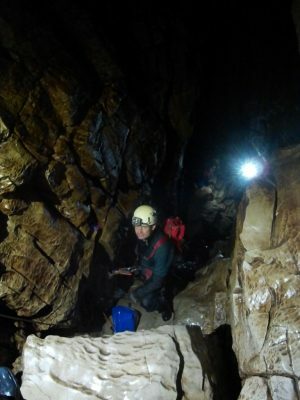 This entry was posted in logbook and tagged Alum Pot, Caving, Gaping Gill, SRT, Yorkshire Caving by David Gledhill. Bookmark the permalink.